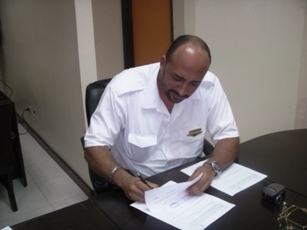 On 23 September 2009, SVGAIR (1990) Limited completed the recertification process for attaining an Air Operators Certificate under the new Civil Aviation Regulations (CARs). 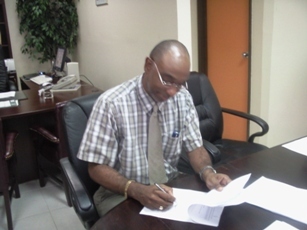 The CARs were promulgated in St Vincent and the Grenadines in 2005. These regulations came into being as a result of an audit carried out by the Federal Aviation Administration (FAA) on the then Directorate of Civil Aviation (DCA) in 1996. The formation of the ECCAA and promulgation of new regulations were but two corrective actions arising from the FAA audit. 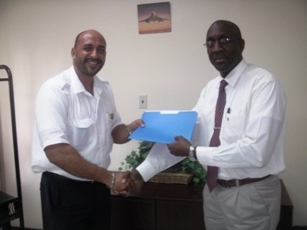 Shown here is Captain Everett Best, Operations Manager and Chief Pilot of SVGAIR (1990) Limited receiving the company's Operation Specifications from Rosemond W James, Director General of the ECCAA. Operations Specifications delineate the parameters within which the airline may operate commercially.